COP21: Where have all the fish gone? How climate change is displacing marine species. This is part of a series on the effects of climate change on oceans and fisheries, which highlights Nereus Program research in preparation for COP21 negotiations. Climate change could affect temperatures all over the world, but what may not be immediately apparent is that climate change will affect ocean temperatures. If CO2 emission rates do not change, the average sea surface temperature is expected to increase by 2 to 3.5 degrees Celsius by the end of the century. This may not seem like much, but it would impact oceans in many ways, making them quite different from how they are today. It’s nearly common knowledge now that the melting of the poles will affect humans and the environment, but there will also be drastic impacts much nearer the equator. Changes in temperatures in tropical areas are expected to occur earlier than in the rest of the world. Marine species are expected to move towards cooler areas, generally closer to the poles and into deeper waters. 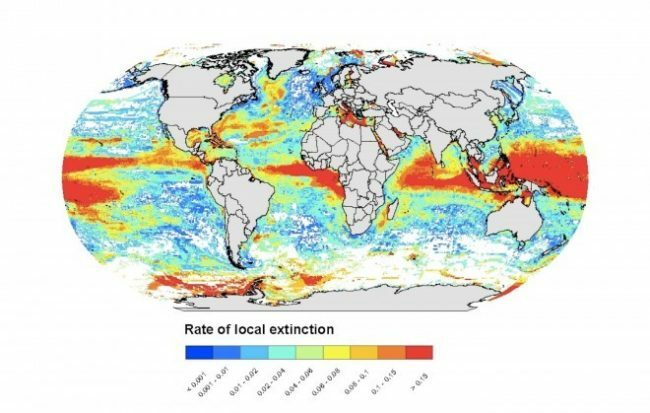 If C02 emissions don’t change, in what’s called the “business as usual” scenario, fish will migrate away from their current habitats 65 per cent faster, resulting in changes to biodiversity and ecosystems. Under the "business as usual" CO2 emissions scenario, fish distributions are expected to shift, generally towards the poles and into deeper waters. 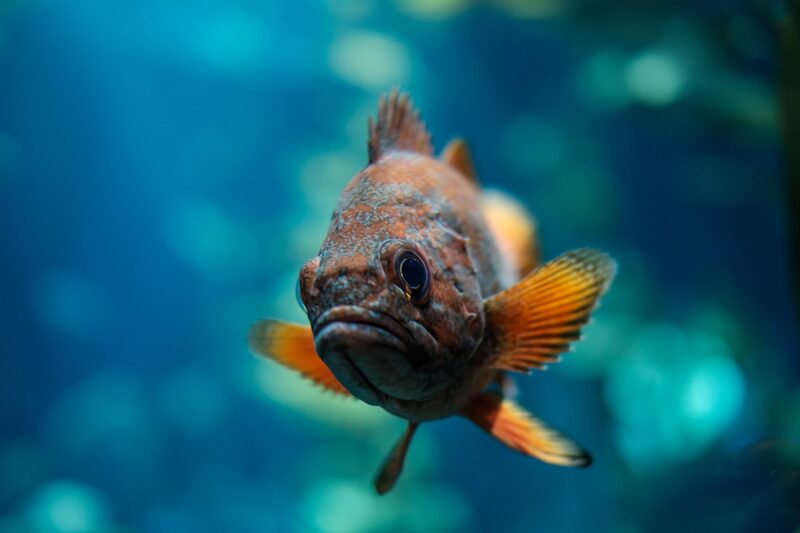 Fish and other organisms in unfavourable environments, such as water that’s too warm, can have their growth and reproduction negatively affected. They could also be killed off. 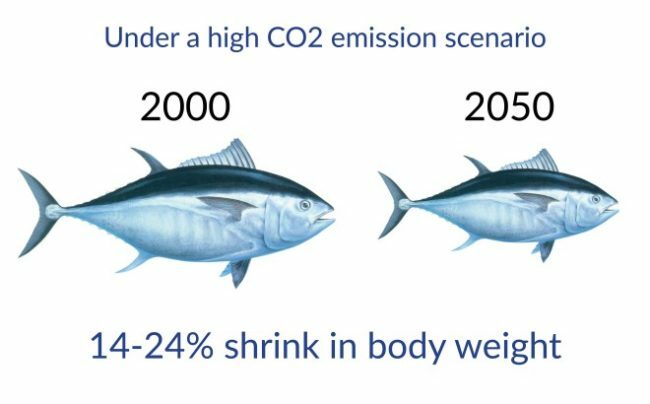 The maximum weight of fish communities is expected to shrink, on average, by 14-24% globally from 2000 to 2050 under a high CO2 emission scenario. Because of this, there will be much less fish near the equator and these fish will also be smaller. Why is this a big problem? Most countries near the equator share a number of characteristics — they are generally developing nations, which are island nations or have extensive coast lines, and are heavily dependent on fisheries as a food source. No fish in their waters would put food security into jeopardy. Many of these countries also have tourism as a major or emerging industry, with coral reef diving and snorkeling a major attraction. The oceans remove C02 from the atmosphere, but this causes acidification and the bleaching of coral. Effects of fish migration will also be felt on countries further from the equator. Off the coast of North America, there may be declines in cold water fish stocks and more tropical fish species might be seen, such as tuna, swordfish, wahoo and mahi mahi. These fish will also decrease in size, given current CO2 emissions. This causes issues for species like tuna, whales, sea birds, seals and sea lions who feed on fish like anchovy. Although there may be more species and an increase in fisheries resources closer to the poles, the effects of ocean acidification, which are expected to be strong in the Arctic, will add uncertainties to any potential benefits. The emerging new fisheries resources and fishing grounds from the lose of sea ice will challenge national and international fisheries management. In addition, the potential increase in other human activities such as oil and gas extraction and shipping would pose additional risk to the ecosystems. Next steps: This research is found in the Nereus report Predicting Future Oceans — Climate Change, Oceans & Fisheries. The report also includes policy strategies to be pursued in light of these issues.